“There is great joy in serving Jesus.” I can’t count the number of times I’ve heard this statement. I’ve even said it many times myself. And deep down, I know it to be true, which is why I’ve had such a hard time reconciling the feelings of stress and overwhelm swirling within me over the past months. After all, I’m serving Jesus to the best of my ability. I am doing all that I know to do to live for and honor Him. So, why am I not basking in joy? Why am I struggling to find my song? As I poured out my heart to God about this, I felt so ashamed. I thought of how many Christians are serving in horrible places and dreadful conditions, yet they praise the Lord with every breath. Here I am with more blessings than I can count, yet I can’t seem to ease the ache within my soul. I feel so alone, so out of place. Some days, it seems as if the task of deputation is far more than my body and mind can take. I long for the peace of God to overflow in my heart and life. I crave the joy I know can only be found in Christ. To quote a line from a song, “I want to believe there’s beauty here.” Yet, I weep in the in-between moments when I finally have a chance to stop and catch my breath. When I can lay down all the masks and costumes of “the good Christian girl who has it all together” and just be me. The real me. The confused me. The disheartened me. The shamed me. I know it’s a privilege to serve the Lord, and I count it as an honor that God would use me. So, why, at this point in my life, doesn’t it feel like a privilege? Why does it feel like a trial? Why is it causing anxiety and stress instead of peace and joy? And what kind of lousy Christian must I be to feel this way? I’m happy to say God met my questions with some powerful verses that opened my eyes to some precious truths. While there is joy in serving the Lord, that does not mean we will always be happy with where He leads us. In fact, sometimes, we’ll be heartbroken and afraid. . .just like Jesus was. Yes, Jesus. He came to this earth to do His Father’s will. He knew He would have to die for our sins. He knew the price He would have to pay, and He was more than willing to do it. But that doesn’t mean He wanted to go through it. He prayed the cup would pass from Him. Praying. Pleading. Sweating blood. If this isn’t a picture of someone who is dreading an upcoming season of life, I don’t know what is. On the one hand, Jesus wanted to do the Father’s will. On the other, He didn’t want to face such cruel agony. To quote another song, “His humanity cried, ‘Lord, any other way.’ His divinity rose up and said, ‘This price I have to pay.’” And if those two passages don’t paint a vivid enough picture, check out what Hebrews says. Did you catch that? Strong crying. Tears. Fear. Oh, that sounds so familiar. Jesus, in the center of God’s will, cried out to His Father. He felt overwhelmed by the task to which He had been called. I see no joy or peace in these verses, only fear and anguish. I see Jesus being obedient but not jumping up and down for joy at the prospect. I see an example that makes me feel less ashamed, less like the worst Christian in the history of Christianity. I see Jesus as a man. A man with emotions. A man living in the nasty now and now and deciding to keep serving whether or not He feels like it. I see a man desperate for different circumstances, for a change of heart and attitude. I see someone seeking for joy amid a less than joyful situation. I see myself. . . and I smile. Jesus has been right here. He’s walked in my shoes. He’s felt my pain. He understands the tears I shed in secret and my seemingly fruitless search for joy and peace in my ever-changing life. He can relate to my roiling emotions and aching heart. And through His Word, He’s reminded me that it’s okay. He’s shown me that while there is joy in serving the Lord, there’s also suffering. At first, that doesn’t seem like much of a comfort, but if we know the truth of that going in, we’ll feel less disappointed and desperate. We’ll feel less alone in our struggles. When we realize that even Jesus Himself dealt with fear and the sense of overwhelm, it helps us know that we’re not as “off track” as we thought we were as long as we continue to follow Jesus’ example and be obedient. And if you’ll look back at that passage in Hebrews, it tells us that Jesus learned obedience through suffering. My life right now may not be all that I hoped and imagined it would be, but through it all, God is teaching me to be obedient. 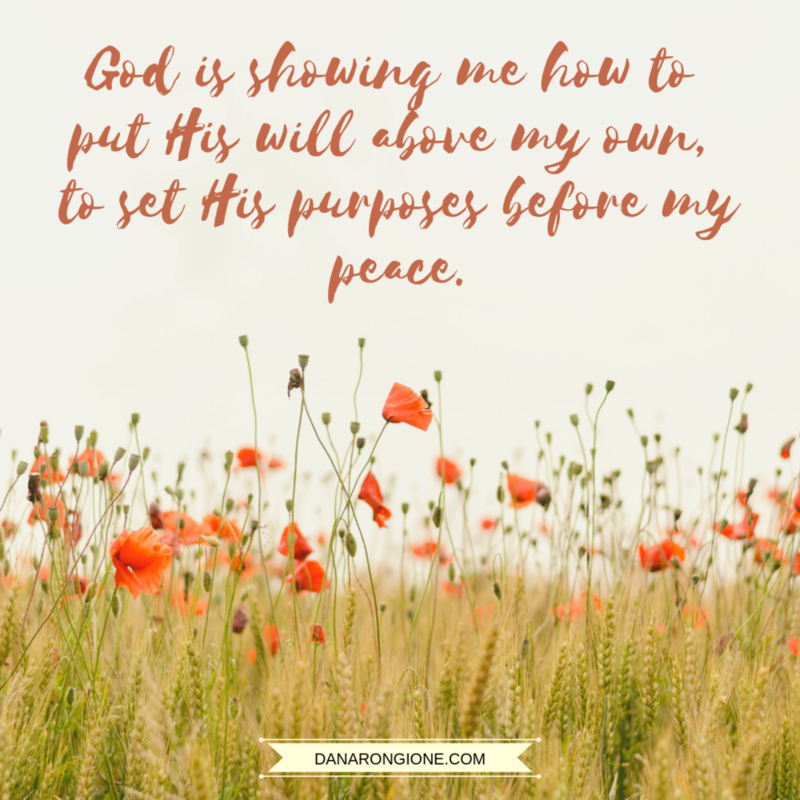 He is showing me how to put His will above my own, to set His purposes before my peace. And in the midst of it all, He’s reminding me I’m never, ever alone, and I don’t have to hide my pain. I can be honest with Him because He knows what I’m feeling anyway. There is a brighter day coming, but in the meantime, I find comfort in knowing I can be myself, and that myself is not such a bad thing after all. A few nights ago, I was awakened by a bright flash of light. Groggy from sleep, I lay still trying to determine what had disturbed my blissful slumber. A long roll of thunder confirmed my suspicions—a storm had rolled in. As the roar tailed off, I expected to hear the pitter-patter of feet on the hardwood floors, but none came, so I closed my eyes and did my best to get back to sleep. I patted the space on the bed between Jason and me, and in no time, the area was filled with 95-pounds of dog. Barnabas snuggled into the space, breathed a sigh of relief, and promptly went back to sleep. Though the storm raged on through the night, Barnabas slept soundly because he knew he was safe with his masters. As I watched/listened to my sweet pup go from anxious to completely settled, I couldn’t help but smile. I can relate. How sweet it is to run to my Master when I’m afraid. When the storms roll around me, and I don’t know what to do, it’s such a blessing to know I can find peace and safety in the arms of my Lord. Sometimes He actively comforts me, but other times, just resting in His presence is all it takes to ease my mind and calm my fears. And not once have I ever been turned away. Every time I’ve approached the Lord and said, “Daddy, I’m scared. Can I sit with you?,” He’s invited me into His presence. Every time! And I know He always will. Are you afraid today? 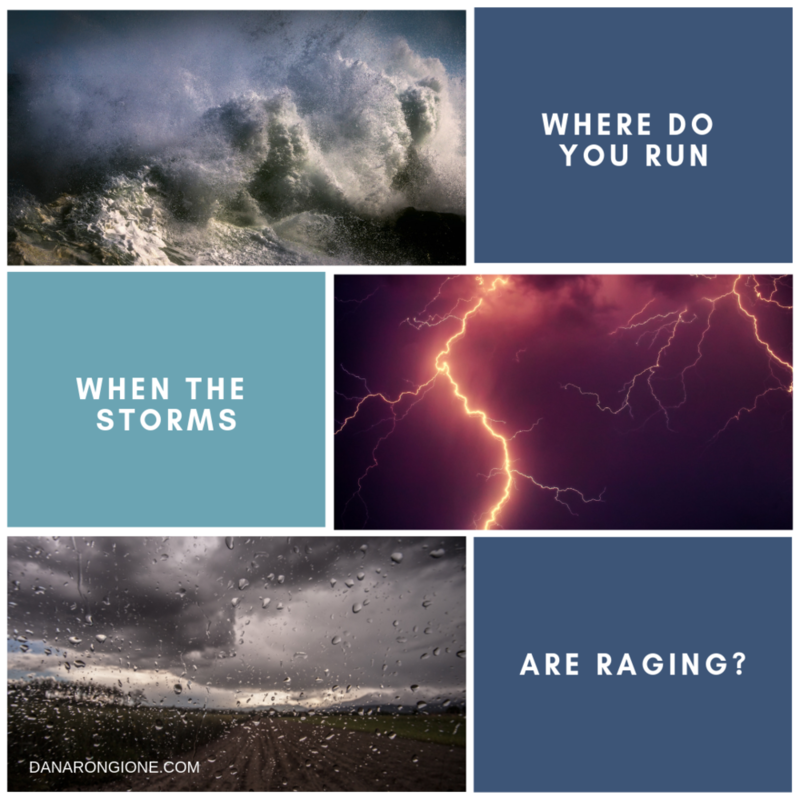 Do the storms have you running for cover? If so, seek refuge with the Father. He loves you and understands your fear. He longs to comfort you and give you peace in the midst of your storm. And He will never, ever turn you away (even if you do have a cold, wet nose!). NOTE: I apologize for the lack of audio lately. Last week, I was sick and had little to no voice. This week, for some reason, my recording software is giving me fits and picking up a lot of background noise. Oddly enough, it’s noise that isn’t really in the background. I have no idea where it’s coming from. Lord willing, I’ll get it running smoothly before long and get back to recording the daily devotions. Gotta love technology! I pulled out this older post today because, honestly, I needed the reminder. This week is packed full with meetings, obligations, end-of-the-month and beginning-of-the-month tasks, and the regular to-do’s like laundry and dishes and walking the dog. When I crawled out of my bed this morning, my head was already swimming with the endless things to do, and I began to fret about how I would get it all done. That was when I heard God’s still, small voice reminding me to breathe, rest, and trust. So, that’s my plan for the week. I’ll take things one step at a time and rely on God’s strength to get everything accomplished. Anyway, I hope you’ll enjoy this old post and that it will help you as it did me this morning. We recently had one of Jason's fellow employees over for dinner. This employee was one of the students in the first K-4 class I taught MANY years ago. Do you have any idea how old it makes me feel for my 4-year-old to now be working with my husband? Anyway, I digress. During dinner, this employee asked me, "Do you ever get bored just sitting around here all day?" I thought he was joking and replied in kind. "Yeah, sure, all the time." He turned to Jason and asked, "Is she being sarcastic?" It was at that point I realized he was asking a serious question. He truly thought I was bored. I looked at him with all sincerity and said, "I would love to be bored once in a while." He seemed confused. Evidently, he has no idea what a day in my life holds. Between writing, blogs, reviews, housework, website work, dog care, exercise, teaching, piano lessons, and church responsibilities, I barely find time to breathe, let alone be bored. Please don't misunderstand. I love my job, and I love my life. It's just very busy, and every now and then I long for some time to just sit and do nothing (if I can remember how). I guess my busy schedule contributes to the difficulty I find in being still and resting in God's presence. There's too much to do. Who has time to be still? But when I take the time, I realize how much more I can accomplish. I feel renewed and refreshed. I feel strengthened and ready to face the tasks ahead. On the contrary, when I rush through the day intent on conquering my "to do" list, I run into problem after problem. In my hurry, I forget to call on God. I neglect the time I need to spend with Him. It's like trying to run a car on no gas. It just doesn't work. How are you doing today? Are you fueled up and ready to go or are you struggling along in your own strength? Take some time out and renew yourself in God's presence. I know it doesn't make sense to our finite minds that if we take time out, we'll gain more in return, but that's how it works with God. Do you want to get more accomplished today? Stop. Rest. Refresh.